NB: Access to much of Farmoor Reservoir is by Thames Water permit only. See Access below for more information. 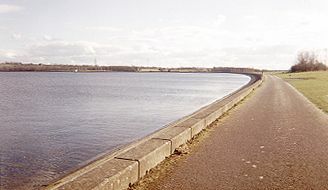 Owned and administered by Thames Water, Farmoor Reservoir is the largest single area of open water in the county, and is probably its most-visited birdwatching site. The two large concrete basins (divided by a causeway) act as a magnet to overflying migrants, and the site has produced an impressive list of rarities, including many county firsts. Beyond the reservoir in a meander of the River Thames is Pinkhill Reserve, a series of shallow pools overlooked by a spacious hide (key required). A second reserve south of the pumping station, christened The Shrike Meadow, was officially opened on 5th May 2000 and will further enhance the site. Grid References Car park at SP452061; Pinkhill Reserve at SP439068; Shrike Meadow at SP438064. Farmoor Reservoir is widely signposted on brown tourist information signs. From central Oxford: leave Oxford via A420 Botley Road; pass under the A34 Western Bypass and turn right into Eynsham Road (B4044). Pass under the A420, then turn left at a mini-roundabout in Farmoor village after approx. 1½ miles (*). The car park is at Gate 3, on the right after approximately ½ mile. From A40 eastbound: leave the A40 at the roundabout just east of Eynsham; turn right (signposted Stanton Harcourt). At the second roundabout turn left into Wharf Road (signposted Botley via toll bridge). Cross the Swinford toll bridge (the toll for a car is 5p as of August 1999). Turn right at the mini-roundabout in Farmoor village and follow instructions from (*) above. From A34: leave the A34 at Botley Interchange, following A420 west (signposted Swindon). Leave at the first exit, after approximately ½ mile (signposted Farmoor). Turn right at the bottom of the slip road, then turn left at a mini-roundabout in Farmoor village after approx. 1½ miles. Follow directions from (*) above. An individual permit to enter the Reservoir costs £10.00, valid for one year from the date of purchase. A one-day permit is available for £1.00. A key is needed to enter the Pinkhill hide, available as a one-off purchase from the gatehouse. Parking at Gate 3 is free to permit holders. Please do not walk along the service road between the Reservoir and the Shrike Meadow as this tends to flush everything off the reserve (and contravenes Thames Water's access rules) - to reach the Shrike Meadow hide, approach as discreetly as possible along the towpath from the Pinkhill direction. For day visitors, a payment of £1 entitles you to park and to use the Countryside Walk. Ducks and other wildfowl, waders, rare gulls (especially Mediterranean, Little and Iceland Gulls), terns. Also passerines (wagtails, chats, pipits etc.) and sometimes raptors. Winter: ducks, grebes, divers and gulls. Possible skuas, Kittiwake, auks etc. following stormy weather. Snipe and Water Rail on Pinkhill Reserve. Summer: breeding Common Terns and Black-headed Gulls; breeding Little Ringed Plover and Redshank on Pinkhill scrape. Hirundines in large numbers at times. Hobby and Cuckoo. Passage: almost anything can turn up; regular Yellow Wagtail, "White" Wagtail, Wheatear, Rock Pipit, Arctic Tern; Dunlin, Little Stint (mainly autumn), Curlew Sandpiper and other waders. Black Tern and Little Gull on frequent occasions. From the car park, walk right up towards the buildings. Scan Farmoor 2 (the larger southern basin) then walk past the Sailing Club headquarters. A blue door on the right before you reach the beginning of the causeway identifies the Fisherman's Lodge where the main Farmoor log book is kept. Please enter any new sightings before leaving - and please identify yourself clearly and legibly so that your records can be incorporated in the OOS database, and verified if necessary. 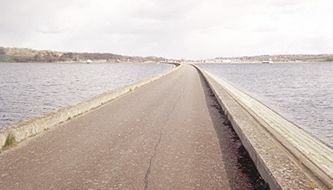 Turn left onto the Causeway (if the slipway on the left is quiet, check for waders or wagtails). Look out on both aprons of the causeway as you go along. Most wader sightings are made here and by stealthily approaching on the blind side, close views can sometimes be had without disturbing the birds. Passerines can also be found feeding here. Hirundines, wagtails and pipits sometimes appear on the roadway as well as on the aprons. Scan both basins continuously from the causeway. Farmoor 1 (on your right) is less disturbed and usually holds more birds, but Little Gull and Black Tern seem to favour the far (southern) side of Farmoor 2 (on your left). Check the buoys in summer and passage times for terns. Also keep an eye out overhead for hirundines, terns and raptors. Both basins around the far end of the causeway seem particularly productive; the tern rafts hold breeding Black-headed Gull in summer, as well as Common Terns, Cormorants and sometimes wagtails and waders. The tern rafts are probably the best place to record colour-ringed Cormorants and Common Terns, records of which (with details of rings) are particularly welcome. A flock of feral geese often congregate hereabouts, which sometimes contains dubious oddities such as Egyptian Goose or Lesser White-fronted Goose. Look along the apron to the north and south for Wheatears, Common Sandpipers and other waders. To visit Pinkhill Reserve, turn right and follow the tarmacked road down the slope of the reservoir. The willows screening the reserve are productive for warblers. The hide is to the left, approached via a padlocked gate (opened by the hide key). Please enter and leave the hide quietly, and close the shutters if you leave the hide empty. A second log book in the hide may be worth a look for details of recent sightings. From the hide scan the open water and islands (some bare, some vegetated); don't neglect the undisturbed areas to the left and right, best viewed from the windows in the ends of the hide. In winter scan the edges for skulking Snipe. In summer Little Ringed Plovers nest on the islands, Common Terns loaf, and Cuckoos favour the bushes and posts beyond the scrape. Kingfisher and Hobby occasionally visit, and Buzzards are often seen over the fields beyond. Barn Owls sometimes hunt over the rough grassland on the far side of the river, and also sometimes roost in the small building visible from the hide. The Shrike Meadow is south of the pumping station at the end of the causeway. It is so named after the Great Grey Shrike which favoured the hedges in this area during the winter of 1998/99. Another bird wintered in the same area in the 1970s. The area can overlooked from the reservoir edge; the hide at the southern end should be approached via the footpath from Pinkhill, and then via the Thames towpath. Please do not use the service road between the Reservoir and the Reserve, as this will probably flush all the birds. The reserve already attracts waders, geese and circling Hobbies. Return to the car park via the Causeway, or round the top of Farmoor 1 if feeling energetic. The reservoir slopes and fences may produce finches and chats, and a series of small sludge lagoons may turn up something. Keep an eye on the ridge of Wytham Hill for soaring raptors. The circuit of Farmoor 2 is an even longer return route, and is patrolled by fishermen. The copse near Lower Whitley Farm holds some woodland species. A full circumnavigation of both basins of the reservoir is about 3 miles. Contacts Warden's Lodge: 01865 863033. Nearby sites Dix Pit, Wytham Wood.